Critics say that if you want the highest-quality streaming video, Vudu’s offerings are better overall than the competition and are notably better in the case of the company’s HDX format. Vudu, which is owned by Walmart, originally required its own set-top box, but it has abandoned that model in favor of streaming video partnerships with a host of consumer-electronics manufacturers. Compatibility with home-theater electronics (HDTVs, Blu-ray players, etc.) isn’t as wide as with Netflix (*Est. $8 per month), but is pretty robust in its own right including support for TVs and Blu-ray players from makers such as Sony, Samsung, LG, Panasonic, Vizio and others. It’s also available on the Sony PlayStation 3 game console and has been recently added to the Microsoft Xbox 360. You can also watch videos in a web browser at Walmart.com or on the Apple iPad. Vudu does a good job of getting current releases on the same day that they are released on DVD and Blu-ray. Movies are also available for purchase (*Est. $5 to $25), but you don’t get possession of the files — just the right to stream them again and again to any device you’ve registered with Vudu. TV programs have become a more important part of the service’s offerings — with more than 800 complete TV seasons offered, many in the highest, HDX quality. Vudu is also the only streaming service to date to offer 3D content, though that library is not very large — just 15 full-length movies and a number of free trailers and demos. Some estimates place the overall movie library at more than 10,000 titles, but only a little more than 5,000 of those are in the higher quality HD or HDX format. Many of the SD-only films are low-quality filler. However, Vudu also has several “art house” collections, including titles from the Criterion Collection and the Tribeca Film Festival. While critics love the video quality, cost is a concern. Titles — especially HDX titles — are expensive. If you are interested in a less costly video streaming service, Netflix has a library that’s nearly as large and charges a flat fee for all the movies you can download and watch. Quality, especially for HD titles, is good, but Vudu is still better in that regard. In addition, Netflix doesn’t have very many of the latest titles. The best comparative review of Vudu can be found at Mashable.com, which offers comparisons and opinions of eight video streaming services. 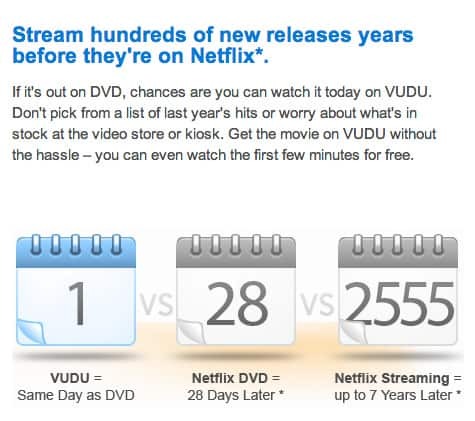 Vudu is also included in the analysis of which services offer the most recent hit movies at TNL.net. ConsumerReports.org compares the content and cost of Vudu to other streaming content providers, while TechOfTheHub.com does the same but includes a host of additional technical details. Other helpful feedback can be found at PCMag.com, About.com, Wired, ITWorld.com and The New York Times.